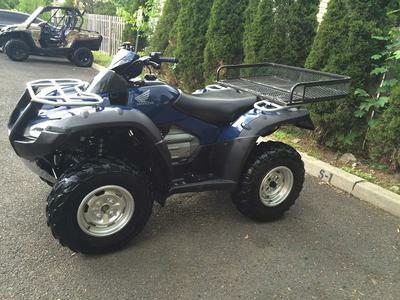 The 2009 Honda Rincon 680 4x4 ATV for Sale is a very clean, midnight blue 2009 Honda RINCON 680 EFI that has low mileage of just 570 miles. ALL this fuel injection model Rincon needs is a new rider. It has NO CARB, NO CHOKE and is VERY EASY TO START! It has the fail proof 680cc ENGENE and a HYDROSTATIC TRANSMISSION. It is in absolutely perfect used condition and offers 100% performance. It always been stored inside a heated garage when not in use. If you have any questions regarding the used Rincon in this classified or if you would like to make an appointment to see it in person or make payment and pick up you can contact me using the information I have listed below and when you call, don't forget to mention that you found my ad on GoGoCycles Used Motorcycles for Sale . If you want to buy the used Honda ATV in this classified I'm willing to discuss the possibility of my delivering it to you. The 2009 Honda Rincon 680 4x4 ATV for Sale is located in Columbus OH Ohio and will not disappoint! If you want to request more information and pics email gracie.clemonsyg "at" juno "dot" com and don't forget to mention that you found this ad on GoGoCycle's Used Motorcycles and Parts for Sale www.gogocycles.com in your message.